thinning and improves skin regeneration,it is anti-aging and beautifying. eczema and minor burns and makes a great lip balm. 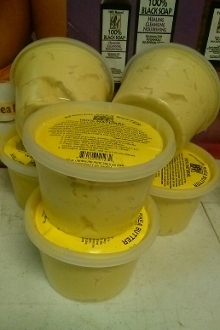 8oz pure shea butter in clear containers. Whipped Shea Butter with the same great benefits.